Home Without Label Wordpress Against Blogspot. Who's the looser? Wordpress Against Blogspot. Who's the looser? Hey guy, you are the lucky number one cause you meet me again and again. This time I still wanna to tell you about blog. in order to fight hunger. Now I'm gonna tell a secret about the combat between wordpress and blogspot. so Let's the battle begin! The differences Platform Blogspot With WordPress - When discussing about the blog, then we will not be separated from the two giant webblog service providers in the whole of universe, They are called the blogger (dot) com and wordpress (dot) com. Blogger (dot) com which provide subdomains form whereas wordpress blogspot (dot) com which provide a subdomain such as wordpress. Despite knowing it, not a few of us who does not understand the difference between the platform of blogspot and wordpress blog platform. Some of them say that it is more Incredible Blogspot, but there are also those who say that it is amazing wordpress. So who is right? The article "Wordpress Against Blogspot. Who's the looser?" I bear to show you the difference between blogspot and wordpress blog platform. Which one is superior, awesome, fantastic and the best for you. The basic thing seen when we use the blogspot is freedom in messing about with the template. This is because blogspot has an HTML extension, so it can be permuted in accordance with the wishes without having to be an expert. Different when we use wordpress. Extensions are used is PHP. Well, the nature of PHP is more on the state of patents and can only be changed by people who are proficient in the field of PHP. So, I think if discusses the freedom to change the blog template then blogspot platform is superior. So as the blog judge, I say the blogspot is the winner. KO..! When discussing the features offered between blogspot and wordpress then there will be a very significant difference. Why?, It's because it's obvious that the features offered by wordpress it very much, even in the hundreds. This feature is provided in the form of plugins. So, if you want to install additional features on wordpress then just download and install the plugin. In contrast with the all-round blogspot limited. Only between the HTML script slightly. So, according to above about the feature superior wordpress blog platform is the winner. KO..! Blogger provides free hosting to users and it is not limited for the rest of its life. In contrast to wordpress which only provides free hosting with a capacity that is not how big. However, when the level you want to change the blog further into the domain TLD then automatically have to hire a wordpress blog hosting platforms to third parties, such as namecheap or HostGator. So yes pay to buy a domain and hosting renting so. if using the Blogspot hosting yes free and unlimited capacity even if you have to replace a blog into a blog with TLD. However, you should know because Blogspot provides free hosting then if one day you violate the TOS of blogspot then get ready for the blog will be deleted without prior notice. So, according to this I am in terms of hosting I give the of both score is 0: 0 or equally strong. Tobe continued to next round fight. Some of peoples say that SEO is applied by wordpress blog platform was more intense use of SEO because it comes from an SEO plugin. However, this statement is doubtful. Why? 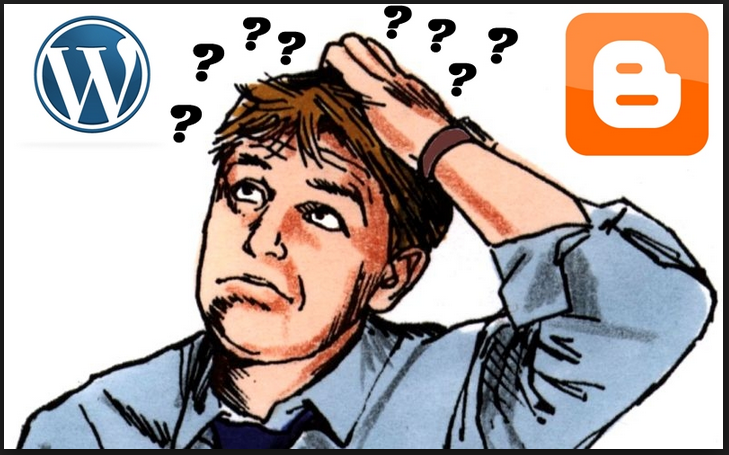 you just try to write a keyword in google then Link blog platform are most often arise?, blogspot or wordpress? Uuugh, wait a minute do not be too quick to conclude yes .... a blogger who usually use wordpress blog platform was the ending to build a professional blog. So could the links that appear in the Google search link wordpress blog platform which has been converted into Blog TLD. So it's hard right on it? So, according to the current position, both are same strong. and it's mean I am the winner LOL. Well, for the one that is the target of a major target of the bloggers. Honestly, if you want to earn money from bloggers are easily certainly be using a blog platform blogspot. Why?, Because the existing blogspot platform HTML Java Script menu. So, stay put there wrote the ad code. Especially for Google Adsense ads. In contrast, if discussed on the blog wordpress platform if you want to get away the earning the blog must first be converted into TLD blog and then there are certain steps that can be installed blog advertising. So rather complicated yes .... But the ending still be installed ad also why. So, according to I when discussing the ease to monitaze then blogspot very superior. But still, in essence wordpress also able tobe monetized. I make a decision the Blogspot Win this round. So, the conclusion is that among the blog platform blogspot and wordpress blog platform it has advantages and disadvantages of each other. If you ask me about which one is better I use it?, Then I would answer that it is up to you buddy!! !